This guide will take you through the steps over troubleshooting RS-422/485 serial interface issues. Loopback tests for MDrive/MForce products only show the most commonly used connectors. 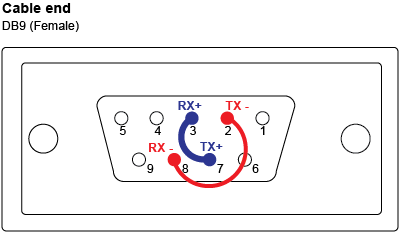 Refer to the product manual for your specific connector style, if it is not shown. Wire, basic hand tools if a loop-back test is required. RS-422/485 communications adapter, drivers installed and connected between host PC and SEM product. User interface software for all Lexium MDrive products. AC Line to DC motor voltage supply. DC supply to Lexium MDrive. When power is ON, LED 1 on the upper-right of the Lexium MDrive heat sink should be solid green. Verify that the DB9 is firmly seated and the screws are tightened. If M12, verify the connector is fully inserted, and the bayonet-lock is engaged. 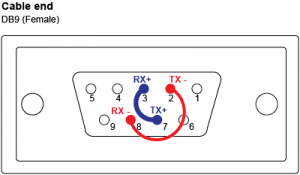 Ensure the crossover between the interface and Lexium MDrive (Rx—Tx / Tx—Rx). Open both the Motion Control Programmer settings dialog and the Computer’s Device Manager. 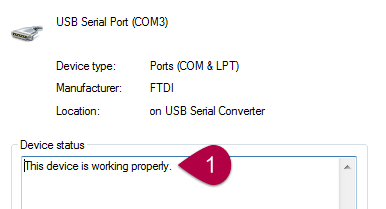 Verify that the selected COM port matches what the adapter is installed on. Verify that the adapter drivers are operating correctly as indicated in the “Device status” text area (1). Do not close the properties dialog. 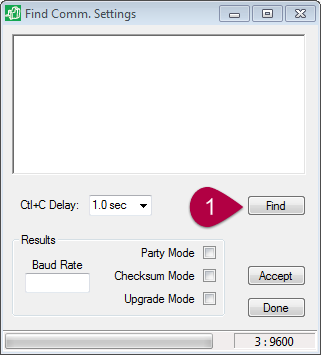 Click the “Port Settings” tab of the COM Port properties dialog, verify the selected BAUD rate matches that set in the Motion Control Programmer Terminal settings dialog. On the Motion Control Programmer, select the menu View > Find Comm. Settings, Click Find (1). Wait while the test runs through the various BAUD Rates/Settings. If settings differ from the defaults, adjust the settings to match the Lexium MDrive. If still unable to establish communications, perform a loop back test to identify where in the communications chain the error is occurring. Ensure the MDrive product is in a powered down state. Disconnect the cable from the MDrive communication port. Add jumpers as shown in the drawings below. Type characters into the terminal window. If characters now echo to the terminal screen, there is a communication problem with the Lexium MDrive product. If typed characters are still not visible, there is a problem with the adapter cable, Motion Control Programmer configuration, or personal computer communication port. The following diagrams are oriented with the cable end facing the user. If the loop back test results indicate a functioning communication link, there is still a chance that the MDrive is communicating properly, but configured in the party mode and you don’t know the device name. The following command sequence will retrieve the MDrive’s name. There maybe no terminal feedback while typing the characters. Type: [CTRL + J]*PR[space]DN[CTRL + J]. The MDrive should return its name in quotes. Further communication then can be carried out by properly addressing the unit by name. The following command sequence will place the MDrive in the factory default state: [CTRL + J]*FD[CTRL + J]. All parameters will be replaced with the factory defaults and all programs erased. There will be no terminal feedback while typing the reset characters and the SEM copyright sign on message will be the result.